New York City based Justine Kurland was born in Warsaw, NY, and is returning to her Western New York roots for her first exhibition in the region. Kurland received her B.F.A. from School of Visual Arts, NY (1996), and her M.F.A. from Yale University (1998). While the artist's address is in New York, she spends most of each year on cross-country road trips and also travels internationally. Kurland scouts out her subjects-mothers, commune farmers, adolescent girls-very carefully, and then poses them in theatrical settings amidst grand landscapes, as if setting a stage in a vast, outdoor theater. The process of selecting the right location and subjects who believe in her vision can take several weeks; she likes to get to know the people and places she works with, immersing herself in different cultures as a sociologist would do. Photographs, Justine Kurland's exhibition at CEPA Gallery will include Cibachrome and silver gelatin prints drawn from three of the artist's recent series, including In Community/Sky Blue; Golden Dawn; and Of Woman Born. 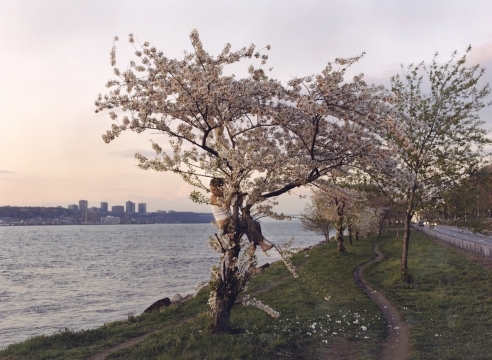 All of the work presented in Justine Kurland: Photographs is courtesy the artist and Mitchell-Innes & Nash. 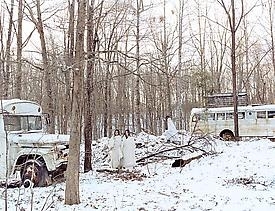 JUSTINE KURLAND Buses on the Farm, 2003 C-print 17 3/4 by 22 1/2 in. 45.1 by 57.2 cm.